The Sprinter 250M is the perfect tool for advanced construction levelling tasks. Store up to 1’000 measurements, download and transfer them for further calculations to Excel® to a PC via USB. The delta height calculation and programs line levelling, cut & fill and monitoring facilitates your levelling jobs significantly. The 0.7 mm accuracy of the 250M and the monitoring program allow machine and construction subsidence measurements. 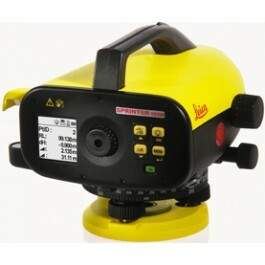 Aim and Focus: With its high-accuracy opticalelements you simply aim and focus the staff as an optical level. Memorize: With their built-in memory for storing up to 1’000 points, the Sprinter 250M avoids transcription errors. Download: With Leica Sprinter 250M, data can be downloaded to your personal computer via USB Interface. The Sprinter DataLoader enables a smooth data transfer to Excel®. Your measurements can also be transferred to an external data collector via RS232 interface.